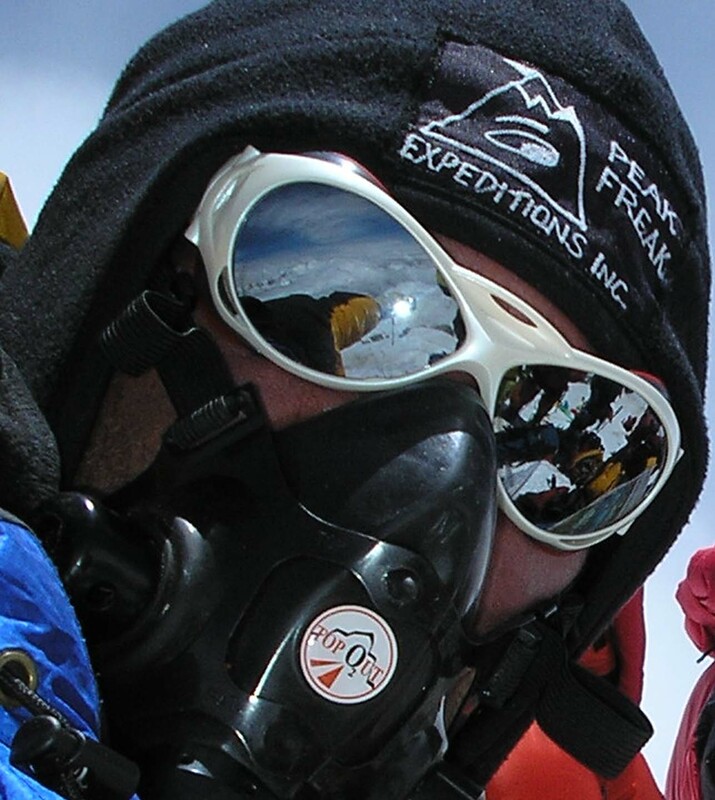 Oxygen systems FOR CLIMBING EVEREST + The new TOPOUT mask. Poisk is so far, the best oxygen system made for climbing Mt. Everest. Manufactured in St. Petersburg Russia, the POISK oxygen cylinders are much demanded for climbing of Mt. Everest and other high 8000- meter peaks. Its volume, size and dimensions have been optimally designed to fit the needs of the high altitude climbers. Most oxygen systems require carrying a heavy bottle to the summit even though it may be close to empty. The Poisk system is designed to use two to three bottles for a summit day of 12 to 18 hours. This allows you to drop and empty bottle on the way to the summit and pick up a strategically placed bottle on the descent if needed. This way you have only one third the weight on your back as you approach the summit. The adjacent photo is a picture of oxygen cylinders the Sherpas retrieved from high on the mountain. In the past many bottles have been left behind on the mountain causing worldwide attention around the debris left behind by expeditions. Today Sherpas are paid a fee to return them for refilling. One POISK –3 high-pressure bottles filled to 260 Bar at 20 degrees Celsius weighs under six pounds (2.7 kg). The dimensions of the bottle are 19 inches long and 4.25 inches in diameter. Four bottles can easily fit into a medium size pack. These bottles are extremely reliable and easy to use. At a 2- liter per minute flow the bottles last approximately 6.5 hours. The POISK REGULATOR is lightweight (0.35 kg), easy to use and very reliable. The regulator is a constant flow device and can be adjusted in ¼ liter per minute increments ranging from 1 to 4 liters per minute. The POISK MASK is similar to the Hornbein mask in that it uses a bladder to conserve oxygen use. This simply means the bladder only releases the oxygen into the mask when you inhale. The mask is insulated to protect your face from the cold, and when combined with a balaclava and goggles your face is completely protected from the elements. Climbers will want to shave beards and moustaches off so the mask fits close to the skin. The number of bottles, regulators and mask needed for a particular expedition is dependent on the size of the expedition, as well as the particulars of the route you are on. The system was designed and has been built specifically for climbing Everest using aerospace standards that I employ with the RAF. This is the only system built specifically for climbing Everest by an aerosystems engineer who has climbed Everest in the process of testing the prototype. No other system has this pedigree. On Everest, it’s the getting back that counts, and if you can get back having been to the top then you are a winner. To win you have to have the best: the best attitude, the best gear and most importantly the best oxygen. TopOut is the difference between winning and simply taking part and will turn pain to pleasure; well it could! TopOut will enable you to enjoy Everest instead of feeling as if every breath is your last. Many have thought of climbing Everest without supplemental oxygen mainly to set records, save dollars or weight. Many try but very few actually do. Even the sherpas use oxygen above 26,000 feet. Babu sherpa did it without oxygen and holds the record of 7 summits without oxygen and 22 hours on the summit. Keep in mind he trained for one full year prior to his first attempt and had an entire team of support people waiting to rescue him. We don't recommend anyone trying it without at least one 8000m attempt without O's under your belt. Please for your mother's sake, don't consider this as an option. In 1994 we were part of a team attempting to be the first Canadian team to summit Everest without supplemental oxygen. We went with the theory that if we stayed longer than normal at altitude our bodies would become super acclimatized offering us better chances. We stayed on for 4 months compared to the normal duration of an Everest climb of 60 days. We became ran down and lost far too much weight and muscle tissue. Some of us were doing okay however, very thin but did attempt the summit until we were turned back when climbing partner John McIsaac from Canmore Alberta developed Pulmonary edema. This was the final crunch that ended the expedition using all our energy to save his life. We were too exhausted to carry on. The dramatic high altitude rescue coordinated by Tim Rippel was recorded on the video production called "Summit Of Dreams" produced in 1994. John McIsaac is happy and healthy and enjoying life in Canmore but his Everest aspirations are over.